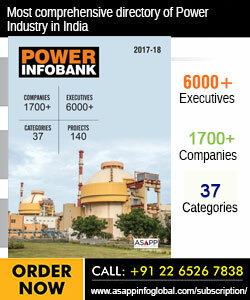 Power Today Magazine | "Least cost ramp-up could be achieved through TBCB only"
"Least cost ramp-up could be achieved through TBCB only"
"Projects worth Rs. 1 trillion will be up for bidding"
Ved Mani Tiwari, Chief Executive Officer (Global Infra Business), Sterlite Power Transmission, believes that transmission projects offer a significant change in risk profile, post the commissioning of projects on account of low collection risks and these projects generally get a priority in funding over other infrastructure projects. How do you plan to leverage the opportunities provided by the government in the Transmission and Distribution (T&D) space? Sterlite Power is the largest private transmission developer in the country having its presence in 19 states and a project portfolio of more than USD 3 billion. The company is poised to take on all the opportunities coming in the transmission sector in the country on Tariff-Based Competitive Bidding (TBCB) route. Sterlite Power has developed large-scale innovative technological solutions platform along with world-class project management skills to ensure that evacuation of projects are delivered before schedule in all cases, particularly in view of the challenging requirements emerging for renewable evacuation. The country has an immediate transmission pipeline of more than Rs 450 billion required to ensure that the ambitious green energy programme of the Government of India is not bottled up due to the lack of transmission and Sterlite Power is ready to shoulder any quantum of work with any stringent timelines in this regard. Since 14,000 km of Inter-State Transmission System (ISTS) projects are under construction, do you see a refinancing or a bond opportunity for the sector? The transmission sector projects offer a significant change in the risk profile, post the commissioning of projects on account of low collection risks and these projects generally get a priority in funding over other infrastructure projects. So there is no dearth of refinancing opportunities in the transmission sector. What are the factors that are driving the growth in India's transmission sector? In the coming years, what would be the market size and business potential for players in the power transmission sector? The transmission sector would largely be driven by the booming renewable generation in the country. The government's plan to take renewables to 175 GW by 2020 would not see the light of the day without a significant ramp of transmission. The sector has not been coming up in the recent years as fast as required for evacuating low gestation period renewable projects. This has even forced the SECI to take back the award of generation of renewables during the last few months. The country would require the transmission ramp up at central level itself of about Rs 1,000 billion, starting from now, to effectively ensure that no renewable generation projects are bottled up as they come up by 2020. A similar amount of network building is required at the state level too to effectively absorb the low-cost renewable power. The history of TBCB in the country, shows that the fastest and least cost ramp up of transmission could be achieved through TBCB only. This route of project execution has ensured that the consumer is required to pay for the transmission infrastructure, lesser by at least 30 per cent as compared to the traditional cost-plus mode of project execution where the government awards projects on nomination basis. States get locked into buying power from costly but linked-up generators in the vicinity, owing to poor or no grid connectivity. Can you suggest any measures for this? Yes, this is a fact that open access has not been implemented in the expected form, which has led to the lack of discretion with the consumers to buy the least cost power even if it is available elsewhere. This situation has a lot to do with insufficient transmission infrastructure availability at the state level. Power for All document spells out the transmission requirement of about again Rs 1,000 billion at the state level as well as to ensure that power reaches to all areas in the different states. Various states, despite the need of transmission, have not been coming up with the projects as they lack resources to raise the assets. The solution is in the implementation of TBCB mode of project execution at state level also. States have not been making use of an enabled policy environment which allows them to invite competitive bidding in the sector and seeking investments from the developers. This process could ensure that the transmission assets could come up without any upfront investments by state governments and also would ensure that the assets get build with least cost and highest efficiency. The state government has not been able to seamlessly integrate renewable energy into the grid which could impede major developments in the sector. What are your views on this? As discussed, renewable integration faces the challenge of raising the commensurate and cost -effective power transmission infrastructure. The position of interconnecting transmission availability is rather grim and the states have not been strengthening their grid due to the lack of resources. With the new tariff policy seeking the states to execute all transmission projects through competitive bidding beyond a threshold limit, there lies the opportunity of states fast building the transmission infrastructure which can reduce the cost of landed power to the consumer and also reduce the currently high level of transmission losses. This would enable consumers to buy low cost renewable power and also would ensure that no renewable generation faces the threat of backing down due to the lack of transmission infrastructure at the state level. As compared to other segments in the power chain, do you think the power transmission sector possess low risk and a steady cash flow? Policy framework in power transmission has evolved very well in recent years; perfectly balancing the needs of stakeholders across the power value chain. In case of power transmission, the contractual framework in case of central projects ensures a healthy revenue collection mechanism with robust regulations to act against defaulting parties. While the upside in power transmission projects is not very significant, the revenue risk is also limited and thus, there is a predictability of cash flows making this business a steady cash flow business. The steady cash flow over 35 years makes this business as a preferred business for long, only investment funds like pension funds. This helps the sector in raising a long-term funding easily and thus, making the capital available on a continuous basis. This has attracted a large amount of foreign investments in the sector, making it one of the most preferred sector. How has the transmission sector helped in tackling the loss of electrical energy? Despite the fact that the Central Electricity Authority (CEA) has been coming out with progressive technical standards, the bidding process has still not been able to incentivise the use of advanced technology through contractual framework. This is exemplified in terms of the restriction on the use of conductors and insulators. "States have not been making use of an enabled policy environment which allows them to invite competitive bidding in the sector and seeking investments from the developers." If the bidding is done on a throughput basis, putting loss reduction as one of the incentive parameters, the country would see a significant loss reduction to be achieved in the transmission sector. Some initiatives have been recently taken, where the equipment required to be installed is being sought to be meeting very stringent low losses criteria, say in terms of transformer losses, etc. However a lot more is required to be done in the contractual framework of transmission bidding which can ensure that all assets being raised in the transmission sector focus on loss reduction, while meeting the throughput requirements. Just like solar auctions, the power transmission sector is also witnessing the same auction pattern of incapable players bidding aggressively for projects. How bad will this pattern affect the sector at large? During the early times of competitive bidding, the proposition as stated above was more correct than now. The sector has matured very well and there are a reasonably good number of financially and technically capable players now in the sector which can execute any size projects with optimal efficiency. This is proven by the fact unlike other sectors, power transmission has seen almost no NPAs or loan defaults. In addition to this, technologically the sector has evolved a lot over the years. Players like Sterlite Power are now executing projects using state-of-the-art technological advancements in terms of LiDAR, Drones, Heli-stringing and various other execution techniques. The execution and project management excellence has built up extremely well in the sector and it is the opportune time for the government to have full thrust in the sector and build all central and state transmission projects through TBCB to ensure that the fruits of this technological evolution pass on the consumer in the form of reduced transmission charges.